AMELIA has always felt like a happy life is just out of reach. Having moved every few years with her mom and sister, she’s always had a hard time making and keeping friends; there’s never enough time, and never enough money to stay in one place. And now, in her senior year, right before tennis season, Mom wants to move again. SOPHIE has a perfectly curated, Instagram-ready life, from her first singles wins to her cute, long-term boyfriend to the beautiful, landscaped home where she lives with her parents. Though they’re tennis teammates, the two girls almost never speak. But then one night changes everything. When Amelia’s car breaks down on the side of the road in a rainstorm, a man she thinks is a Good Samaritan pulls over to help her. When he tries to abduct her instead, she escapes into oncoming traffic. In one inexplicable moment, Amelia and Sophie switch bodies. Amelia wakes up in Sophie’s body. Amelia’s body is in a coma. Now Amelia needs to find a way to switch back into her own life—but before that, she must retrace her steps to unravel the mystery of the accident, her attempted abduction, and how it’s all tied to her mother’s secret past. I always find it difficult to review books that I would class as “just… okay”. There is very little to say about them and I don’t feel as though I can give an in-depth review because I have nothing of substance to say. These are the kinds of books where the characters are alright, the plot is okay, and the writing is nothing standout. There’s nothing bad about them, but there’s nothing particularly good either. 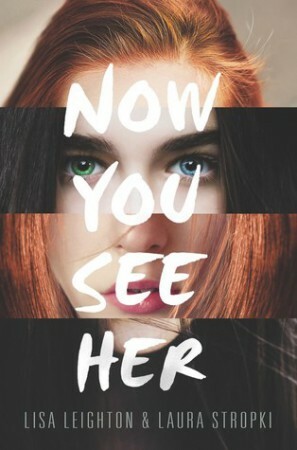 Now You See Her is one of those books. I felt like I had read the entire thing before (many, many times) and it doesn’t bring anything new to the YA world. It felt more like an episode of a TV show than a book, and nothing about it was particularly captivating. Oh this is sad. I had this on my TBR and was looking forward to this book but not sure I want to read it now.